Bermuda’s roses have been highlighted in the ‘World Rose News’ — the journal of the World Federation Of Roses Societies — with John Swift writing an article about rose stamps that have been issued by the Bermuda Post Office over the years. “With all the lovely roses growing around the island, it was a natural for the Stamp Design Advisory Committee to use roses on Bermuda postage stamps,” wrote Mr Swift. “On the 21st April, 1988, a set of five stamps was issued under the heading Old Garden Roses. 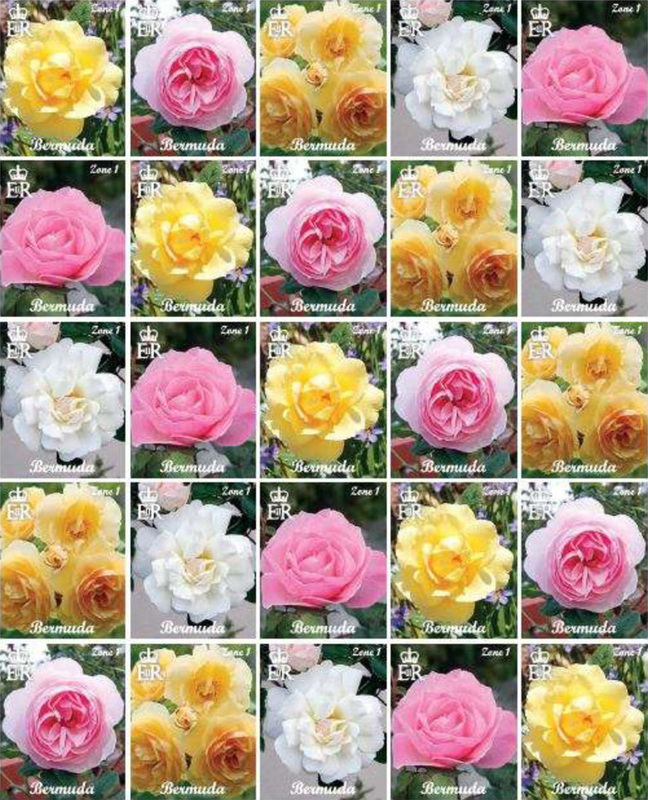 The second series of the Old Garden Roses was issued on 13th July 1989. Again there were five stamps issued. “On the same day, 13th July, 1989, the third series was issued, with designs similar to the second series using the Royal Cypher. This time the stamps were all 50c as a booklet issue and featured roses as shown in the first and second series. “The fourth series of the Old Garden Roses was issued on 1st April, 1993. The stamps were again in a booklet form with a much smaller stamp. There were four stamps in 10c, 25c, 50c and 60c all showing the ‘Duchesse de Brabant’ rose. “In 2013 The Bermuda Rose Society published a wonderful book Roses in Bermuda Revisited. This book gives detailed information on the various roses grown in Bermuda together with superb photographs taken by various members of The Bermuda Rose Society. In conjunction with the publication of the book a set of four stamps was issued under the heading Mystery Roses. “Following the issue of the four stamps in 2013 another set of 10 stamps was issued on 18th November, 2014. These stamps were in two strips of five stamps and as for the set of four issued in 2013, all the stamps showed photographs of roses taken from the “Roses In Bermuda Revisited” book. “Each stamp had the Royal Cypher and the word Zone 1. This replaced dollars and cents as Zone 1 stamps are used on mail going to the United States and Canada. The ten stamps feature the following roses, ‘Baronne Henriette De Snoy’, ‘William R. Smith’, ‘The Brownie Rose’, ‘Carnation’, ‘Graham Thomas’, ‘Heritage’, ‘Lover’s Meeting’, ‘The Queen Elizabeth’, ‘Mermaid’ and ‘Prosperity’. The World Rose News is a publication that is sent to rosarians throughout the 40 countries that belong to the World Federation Of Roses Societies. The Bermuda Rose Society was one of the first societies to join the World Federation, and is well known in the rose world for its Mystery Class of roses. In July 2015 at the WFRS Convention in Lyon, France, The World Federation of Rose Societies Literary Award was presented to The Bermuda Rose Society for their book “Roses in Bermuda Revisited”.